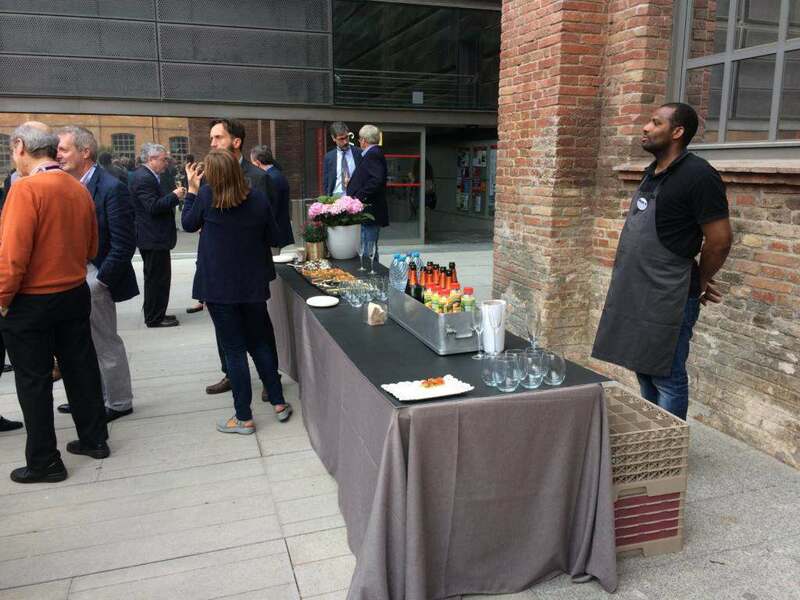 Beautiful Barcelona was the site for this year’s Fiesole Collection Development Retreat, sponsored by the Charleston Company and Against the Grain, and hosted by the Universitat Pompeu Fabra (UPF) and Casalini Libri. This year marked the 20th anniversary of the retreat series. 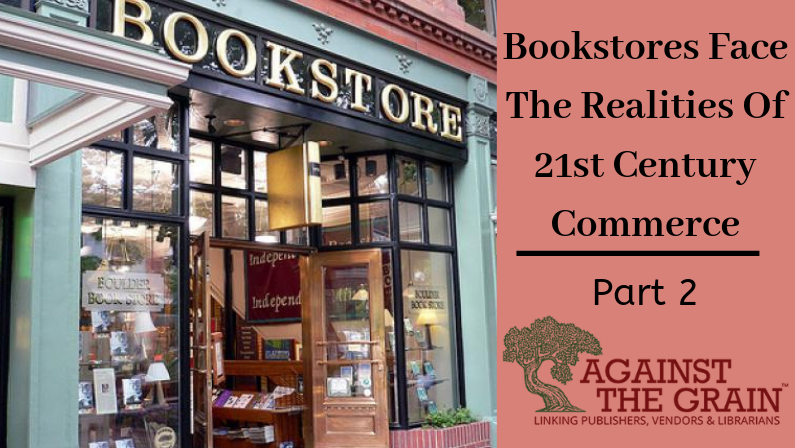 Its aim is to host talks about the future of libraries, publishing, collections, and scholarship. 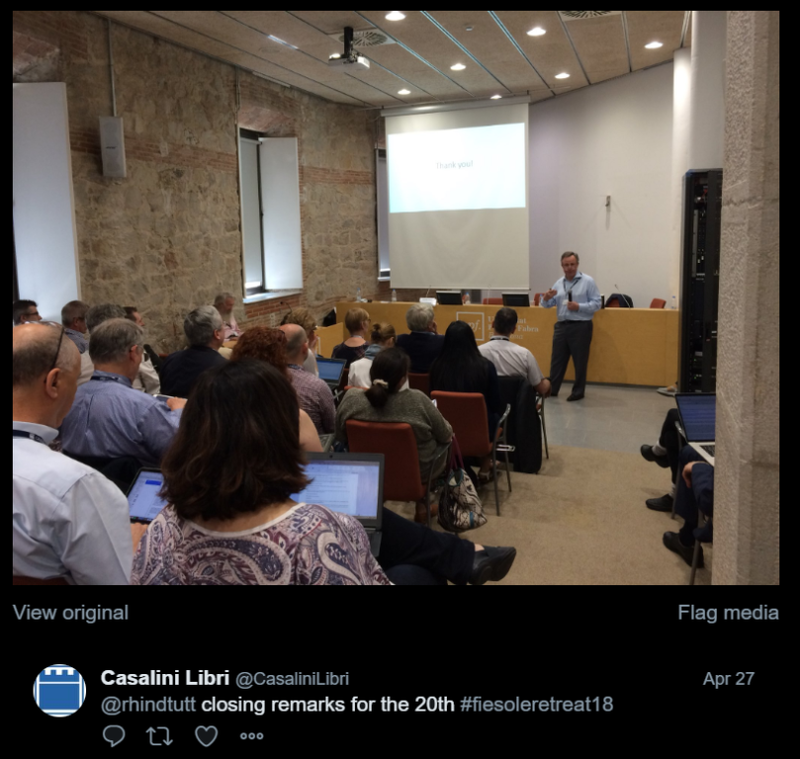 The small group size, around 80 attendees, paired with a schedule that is structured to allow time for thoughtful discussion and rumination on the topics, gives Fiesole an environment unlike any other industry event. Although UPF is one of the newest universities in Barcelona, the campus is a wonderful blend of old and new architecture. 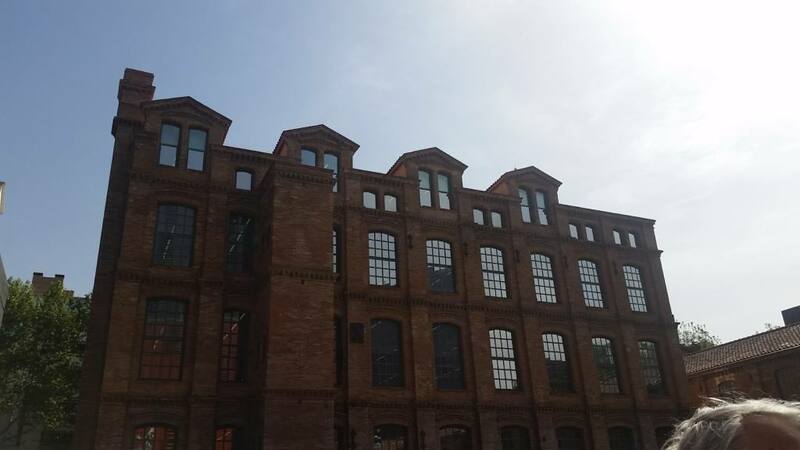 The Poblenou campus, where the first two days of the retreat were held, is housed in a former textile mill. The large brick chimney and brick buildings are visible reminders of the previous use of the facility. 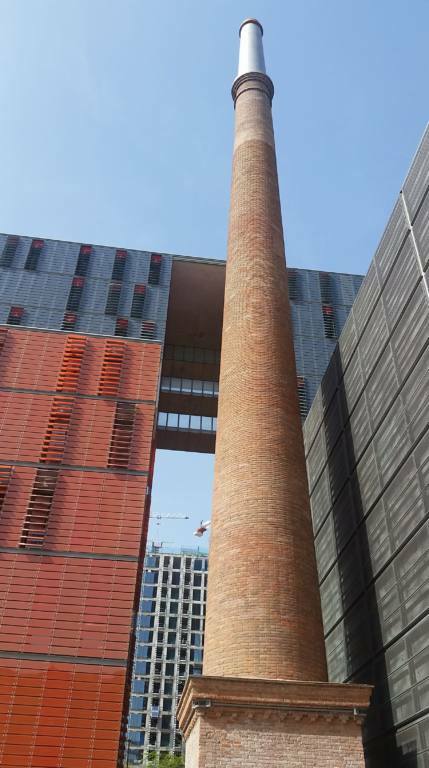 On Wednesday, April 25, the retreat kicked off with a tour of the Poblenou campus library and technology center, as well as the Museu Can Framis, a fantastic museum of modern paintings next door to the campus. Attendees gather in the Plaza Gutenberg to await the preconference tours. The brick chimney from the old textile mill remains in the Plaza Gutenberg. Exterior of the library at the UPF Poblenou campus. Following the tours and a buffet lunch sponsored by Puvill Libros, there was a preconference session on Digital Humanities and Digital Scholarship convened by Dr. Andreas Degwitz from the Library of Humboldt University, Berlin. A common theme throughout the presentations was the number of challenges faced across the different countries and institution types. Some of the challenges were internal, such as budget cutbacks, staff willingness to change, bringing in new staff, management issues, etc. More often the challenges were external, such as government directives and funding issues. 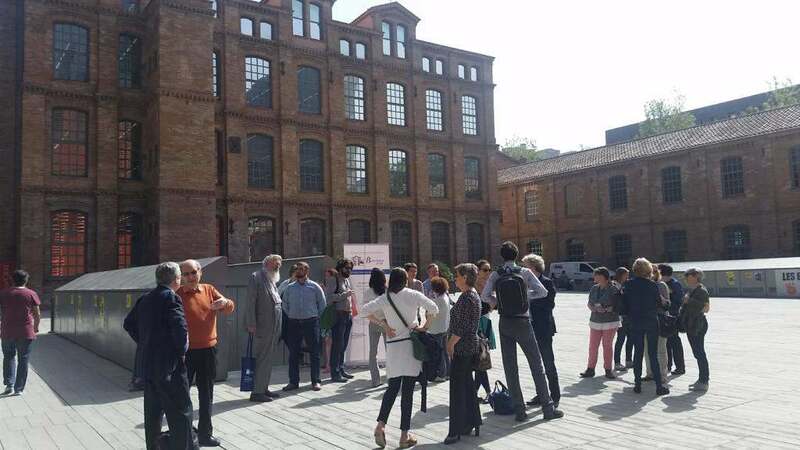 The preconference included a refreshment break halfway through the presentations, sponsored by MDPI, and was followed by the opening reception in the Plaza Gutenberg courtyard. Thursday, April 26, marked the beginning of the main conference. Retreat attendees were graciously guided by UPF staff around a small, peaceful student protest of rising tuition costs. 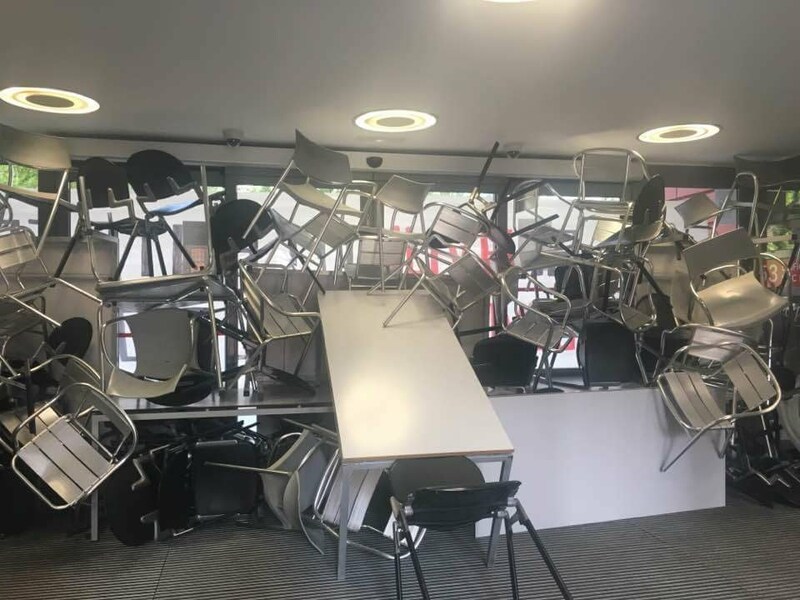 Artistic barricade of the doors as part of a student protest on Thursday morning. The presentations begin with a welcome and introduction from Rebecca Lenzini, President of the Charleston Company, and Michele Casalini, Managing Director of Casalini Libri. 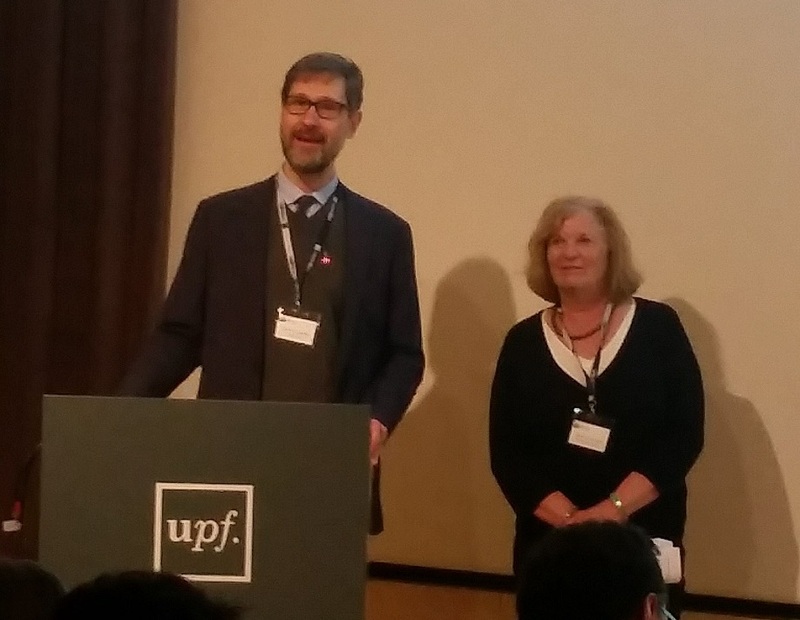 The opening remarks from Enric Vallduví, Vice-Rector in charge of directing projects in the field of research at the Universitat Pompeu Fabra, included some history and information about UPF as well as a short video. Welcome from Michele Casalini and Rebecca Lenzini. 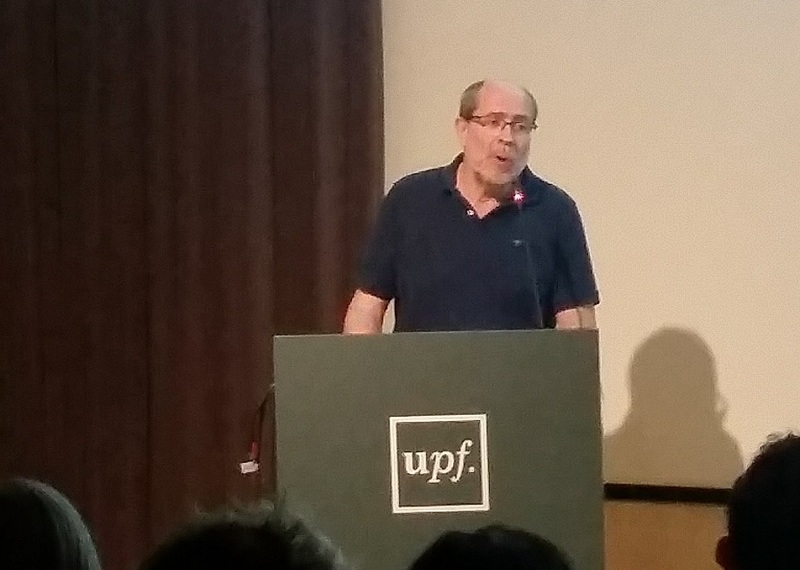 Opening remarks from Enric Vallduví, UPF. 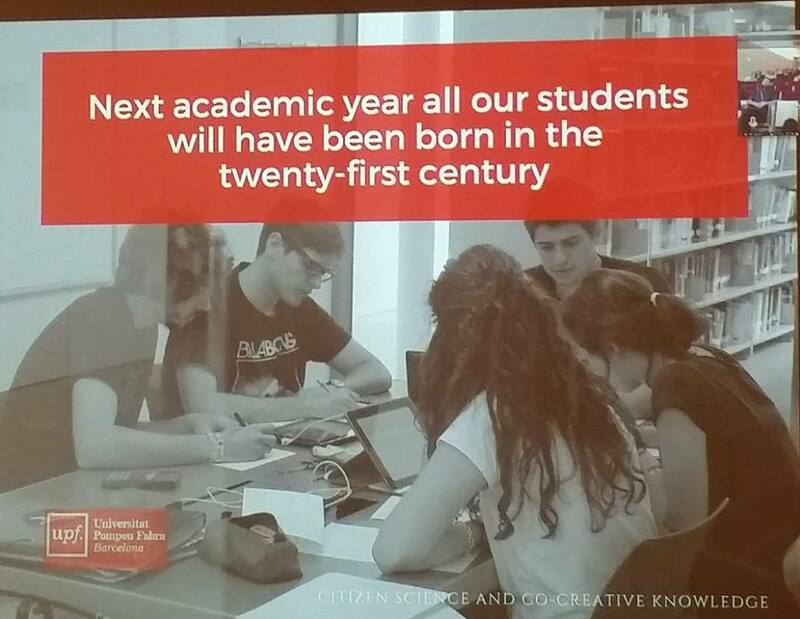 The keynote presentation was an update from Glòria Pérez-Salmerón, Diputació de Barcelona, IFLA President, Presidenta de FESABID on the IFLA Global Vision Report Summary – Top 10 Highlights and Opportunities (slides). IFLA conducted a survey and received 21,772 votes from 190 UN member states across all generations and library types. Survey respondents had a combined 469,152 years of library experience! The key findings of the survey were that, “We are united globally in our goals and values,” and that, “We must connect global and local actions effectively.” The top 10 highlights and challenges are available as a PDF download. 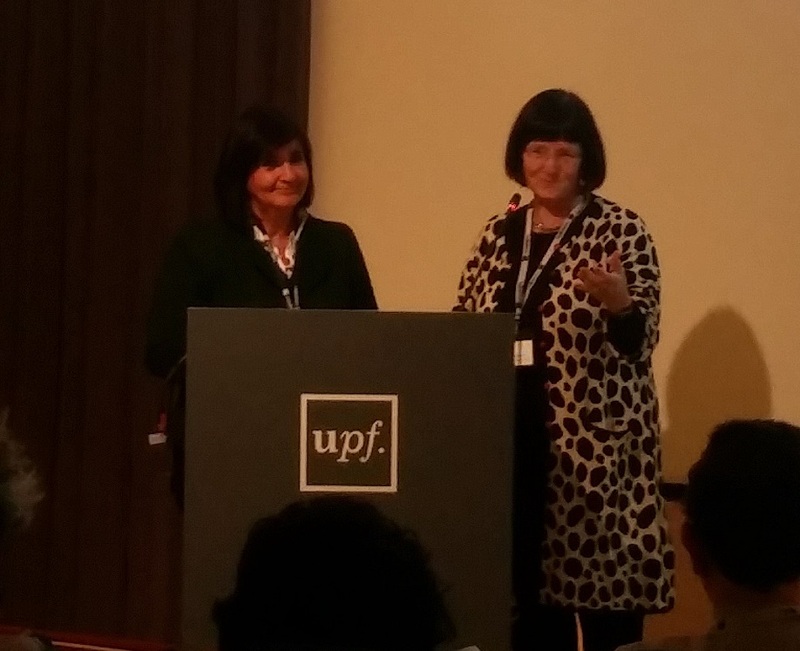 Glòria Pérez-Salmerón, President of IFLA (L), being introduced by Ann Okerson, Senior Advisor to the Center for Research Libraries (R). His library has moved in just a few years from a print library to an electronic library. Spending 80% of the budget on e-resources, only 20% on print. Challenges and Directions – disruption caused by changes in acquisition models: licensing vs. purchasing. Librarians are not comfortable with the new “big deal.” Hesitant e-book market in Spain – distrust of publishers despite e-book production increase by 26% of published titles. Dichotomy between patron-driven models vs. curatorial approach: unavailability of e-books for student use (recommended readings are often not offered electronically). 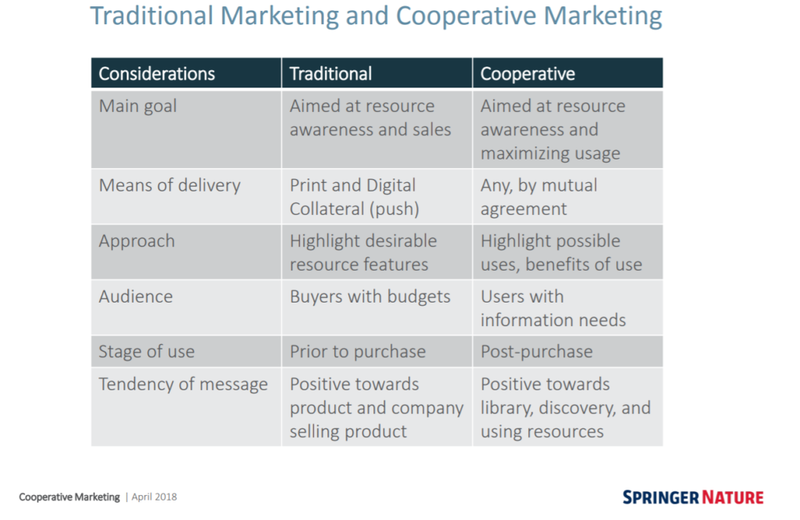 Preservation of print books – local vs cooperative – books not included in cooperative collection development plans; preservation is a local issue for the most part; digital preservation linked to digitization projects – Hathi Trust, LOCKSS, etc. Resources available through vendors like Adam Matthew, Alexander Street, Gale, etc. make it possible for undergrads to do high level primary source research. 4 trends: increased investment in special collections, redefining special collections, grown of digital primary source collections, and interplay between traditional and digital. “Digital collections are homogeneous collections.” Most libraries in North America have the same databases, and everyone has access to Google and Wikipedia. SC add diversity, make collections stand out. Give students a special experience. Does the widespread availability of digital primary source collections make special collections less special? Or not special at all? Or does it change the emphasis of special collections. Redefine “special” – needs to include digital content, new subjects and material types. Democratization of knowledge for people who may not be able to afford university. What is the library’s role? Citizen Science – in the last year this term has been in vogue. Open Science – citizens have contributed to knowledge and research. Usually the focus is on lateral movement – university provides knowledge to students, but we don’t think about how students provide knowledge to the university. “Prosumers” – producers and consumers. In some MOOCs, students help classify and organize information from the course. 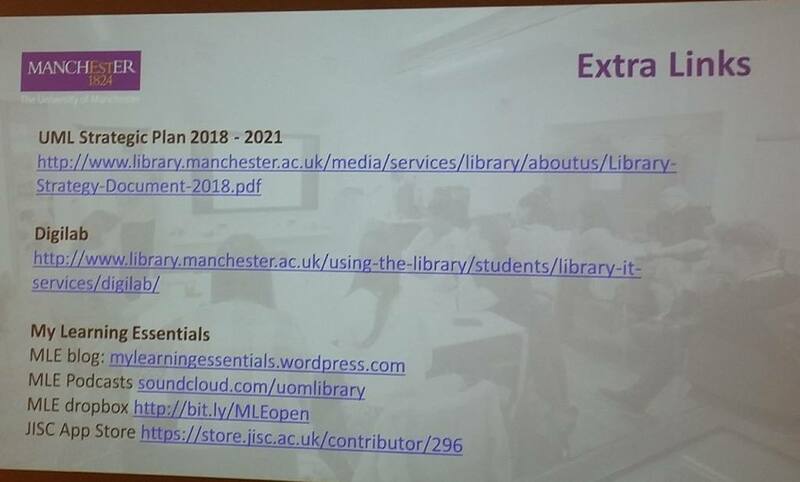 The role of the libraries in the MOOC process – traditional roles of documentation, preservation, dissemination, legal control, are also necessary for MOOCs. Services, Technology, and Information Resources Area- Library + IT Services = CRAI (Learning and Research Resources Center). Common website and share same space. 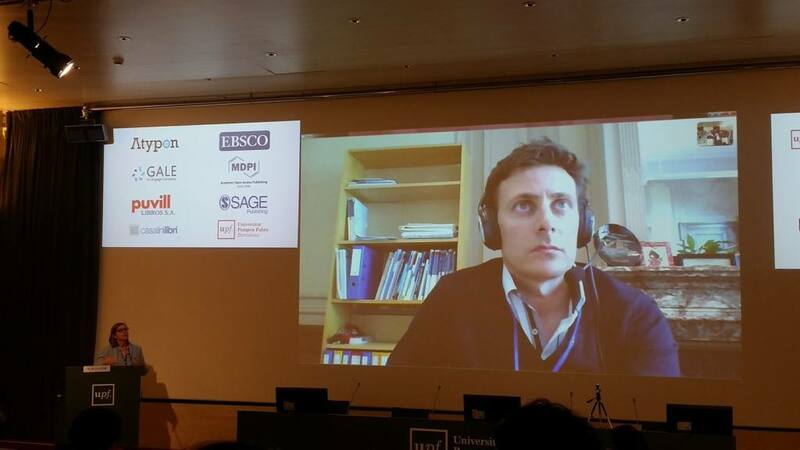 Anna Magre (at the podium) presents alongside Manuel Jimenez, who connected through Skype to participate remotely. Sobering statistic from the UPF presentation. Traditionally, data locked up in databases and filing cabinets. Now more open and available to valuable and useful things. Drivers: 1. Data-informed decision making (not based on guess work or predictions) decisions on how to use resources 2. Understanding and quantification of educational processes – increasingly expected to justify expenditures based on quantification. 3. Meeting govt requirements for funding, etc. 4. Pressure from students – expectations for data to be used to help them. “Why aren’t you doing something with it?” Students are used to constant gathering of info from social media. Nottingham Trent Univ – project goals are primarily to enhance retention. Got the attention of senior management elsewhere. Affects economic bottom line – identify students at risk of drop out and attempt to prevent it. Also to increase a sense of belonging within course community – can see student participation on a dashboard – attendance, books checked out, etc. To improve attainment. Univ of Technology, Sydney – project goals to reduce student attrition, identify “killer subjects” with low pass rates, show students their study and engagement patterns, develop personalized adaptive learning, tailored learning. Moving away from one sized fits all. Applications – 1. early alert and student success, 2. course recommendation – course success predictions, using student aptitudes, previous performance, recommend courses to take next. Is this a dumbing down of curriculum? Steering students toward easier subjects they’re predicted to pass? On the other hand, could lead to future success and prevent drop out of the uni. 3. Adaptive learning – personalized model 4. curriculum design – huge possibilities for better understanding how our curricula are being received and learned through by students – behavior and performance of students. Data – demographic data – can be highly predictive of student performance. Academic data – prior performance, learner-generated content. Learning activity data – big data accumulated from activity on campus. Educational context data – data about the course itself, who the professor is, etc. Predictive modeling – look at previous student data – plot results of number of times the student accessed the LMS vs their grades. Very general predictions, always exceptions to the rule. Invite external demos from companies who want to try out their products on a live student audience, along with University demos – researchers, student projects, etc. One-off events – education student sessions, museology project in collaboration with Manchester museum. Each year, the next cohort develops on the previous year’s work. Event feedback – 96% attendees said they learned something new. My Learning Essentials – skills delivery – library’s award winning skills program. Includes both an open and embedded program – both online or in person workshops. Student team – write blog posts about the process, create podcasts on study skills, took over Twitter feed. 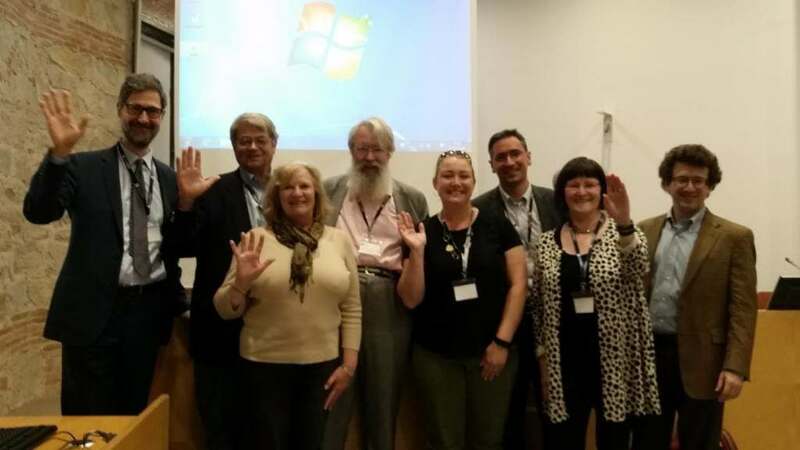 Open course content – UML runs 2 credit bearing course units – virtual learning envirnoment (VLE) felt too “closed” – chose to use a more open platform – mainly a natural way to express their commitment to openness. Published on Medium – social journalism/blogging platform. Sharing Exercise – go contribute and add content in the next few days – give examples of co-creation at your institution. Links from Katy Woolfenden’s presentation. Eric and Clement provided a live demonstration of their platform for visual discovery tools. Laure presented the studies and outcomes at their Lilliad learning campus. The group also wrote an in-depth paper on the project. 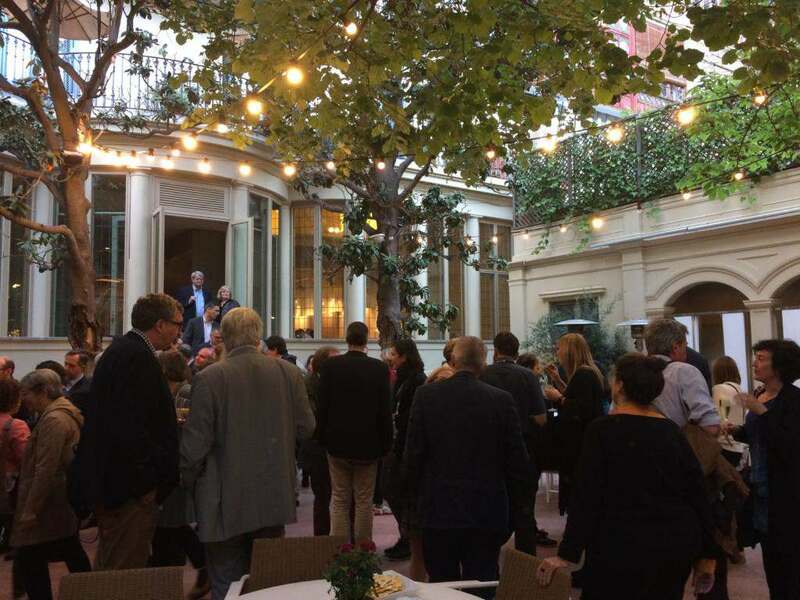 We closed the day with an amazing conference dinner at El Principal del Eixample, sponsored by EBSCO. Ward Shaw and Rebecca Lenzini, framed in the doorway, welcome attendees to the conference dinner. 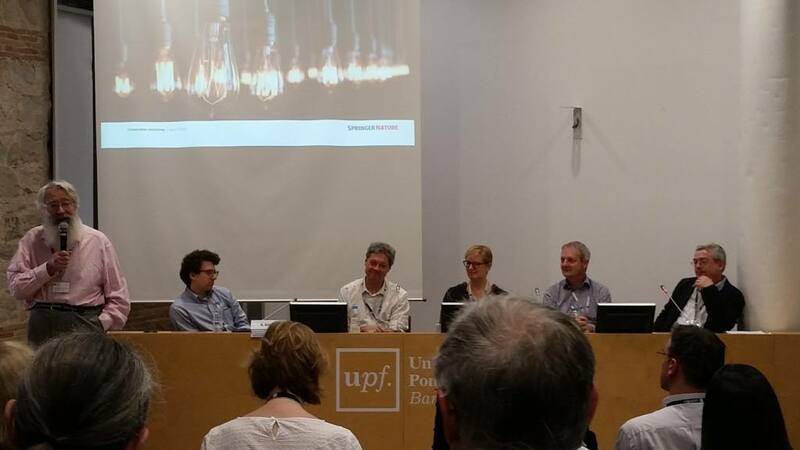 Friday, April 27, was the final day of the retreat, and presentations were held a new location: the UPF Ciutadella campus (video). Session Three was titled “Collaboration Enabling Scholarship,” was moderated by Anthony Watkinson, CIBER Research and University College London, and featured five presentations from various viewpoints in the scholarly communication industry on that topic. 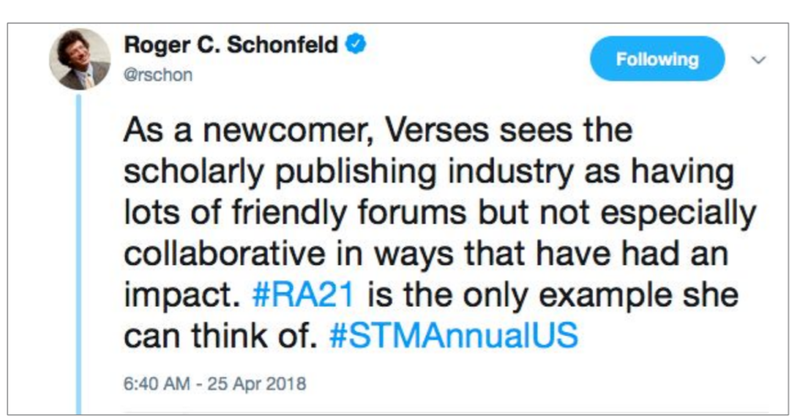 The Scholarly Kitchen recently had an article, “Ask the Chefs: What will ye be writing about 5 years from now?” Readers weren’t mentioned at all. Policymakers want research results accessible beyond the academy. Need context and background to help understand the content. Authors need to promote their stuff too. Spend an average of 15 minutes and get 23% more readers per Kudos. Adding accessible layers has helped usage of OECD pubs triple since 2012. Putting Down Roots: Securing the Future of Open Access Policies, by Rob Johnson, Research Consulting; presentation at Pasteur4OA Final Conference. OA Landscape – different in every area, each country. OA in Humanities and Social Sciences – like a milky way – lots of different stars in the same system. OPERAS-D project in Europe studying OA in humanities and social sciences – survey of publishers – lack of understanding about what are the difference platforms, technical mapping among partners for storage/database size, etc. Session Three panelists ready for the Q&A session. L to R: Anthony Watkinson, Roger Schonfeld, Pierre Mounier, Alice Meadows, Toby Green, and Bob Boissy. Content is giving way to workflow – should the research university outsource more core scholarly infrastructure? The largest publishers are becoming workflow providers. 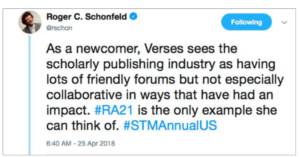 What strategies are available for the smaller publishers being left behind? Showed how ORCID and Metadata 2020 are both examples of collaboration across the industry, in addition to many more. ORCID launch partners included not-for-profits and commercial companies of various sizes, as well as several colleges and universities. Board members are similarly spread across the spectrum. Community working groups helped launch – over 70 contributors from across the information industry. 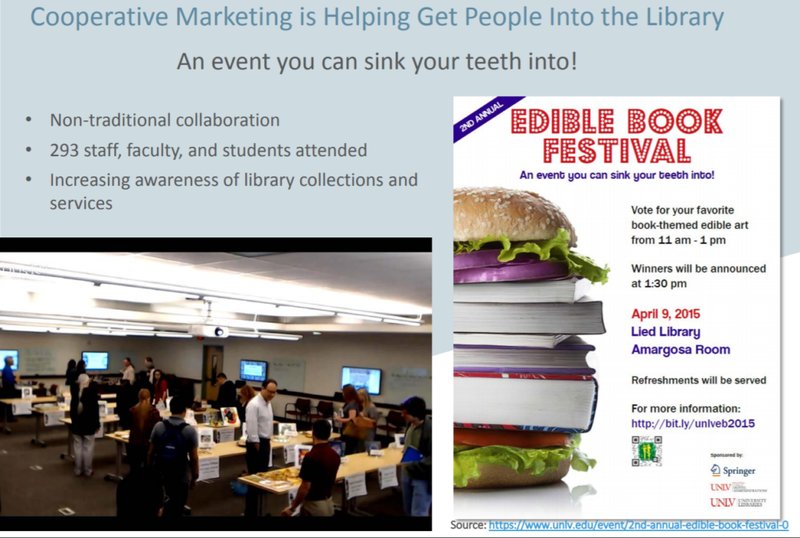 Helping to get people into the library with special events, etc. The retreat finale was the Closing Session presented by Stephen Rhind-Tutt, founder of Alexander Street Press, a ProQuest company, and President of Fairfax House, a consultancy in electronic information product development. Stephen did a fantastic job of summarizing all the themes and important points that were raised over the course of the week. Excerpt of closing session slides from Stephen Rhind-Tutt. 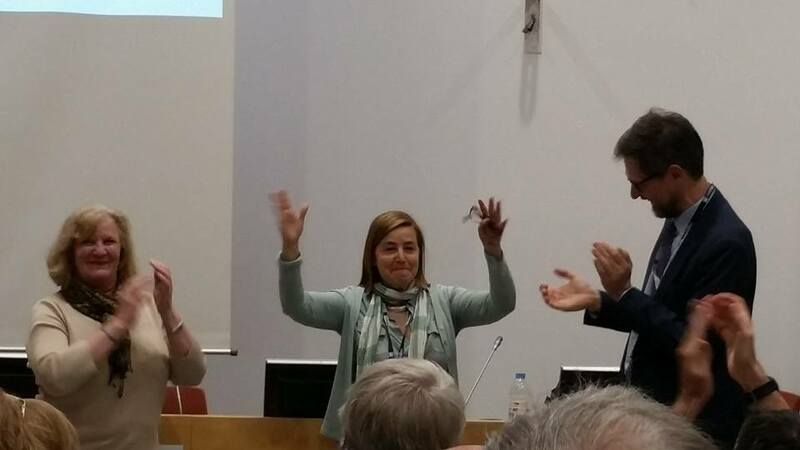 A big hand to our hosts (L to R): Rebecca Lenzini, the Charleston Company; Anna Magra, UPF Biblioteca CRAI del Poblenou; Michele Casalini, Casalini Libri. Hello from Barcelona! Waving to Katina Strauch, Founder of the Charleston Conference, Editor of Against the Grain, and Co-Founder of the Fiesole Retreats. Next year’s retreat will be held back in Fiesole! Dates and more information to come.